Method: A modified quick, easy, cheap, effective, rugged and safe (QuEChERS) extraction method followed by a simple isocratic reversed-phase high-performance liquid chromatography was applied to the simultaneous analysis of Sodium Benzoate (SB) and Potassium Sorbate (PS) preservatives in some dairy products was developed. Results: At first, comparison of the obtained results using original unbuffered and modified buffered QuEChERS versions was done. Then, in order to improve the extraction recovery of SB and PS and clean-up efficiency, some effective parameters were optimized. Satisfactory extraction recoveries (94.0 and 99.8 for SB and PS, respectively) were achieved under optimum conditions. In order to obtain low matrix effect (<20%), quantitation was performed in the presence of an internal standard by referring to a matrix-free calibration curve. The regression coefficient 0.998 and 0.999, and the limit of detection 0.01 and 0.02 µg mL-1 were obtained for SB and PS, respectively. Recoveries for quality control samples prepared by blank real sample fortification were between 95-112% with relative standard deviations (RSD) less than 6%. Finally, SB and PS were determined in various dairy products such as dry milk, milk, yogurt and yogurt drink (Doogh) with relative recoveries in the range of 81-107% and RSDs less than 9%. The obtained results were confirmed using liquid chromatography-mass spectrometry. Conclusion: This methodology, which was successfully applied to dry milk, milk, yogurt and yogurt drink (Doogh) samples, enables the determination of the target analytes in the width concentration ranges. 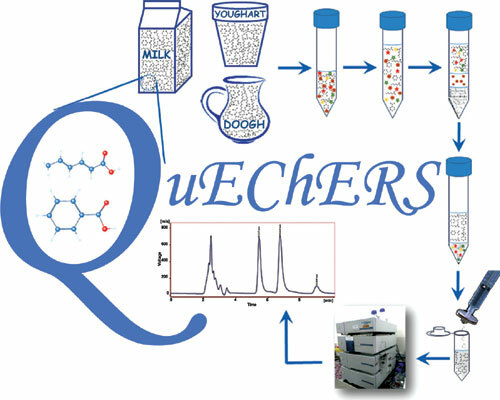 QuEChERS, Experimental Design, Milk, Yoghurt, Yoghurt Drink, LC-MS.